Junior forward Nawfel Bichiba keeps the ball away from a Siena Heights defender during Point Park’s first win of the regular season last Saturday. The Pioneers defeated the Saints 2-0 at Highmark Stadium. 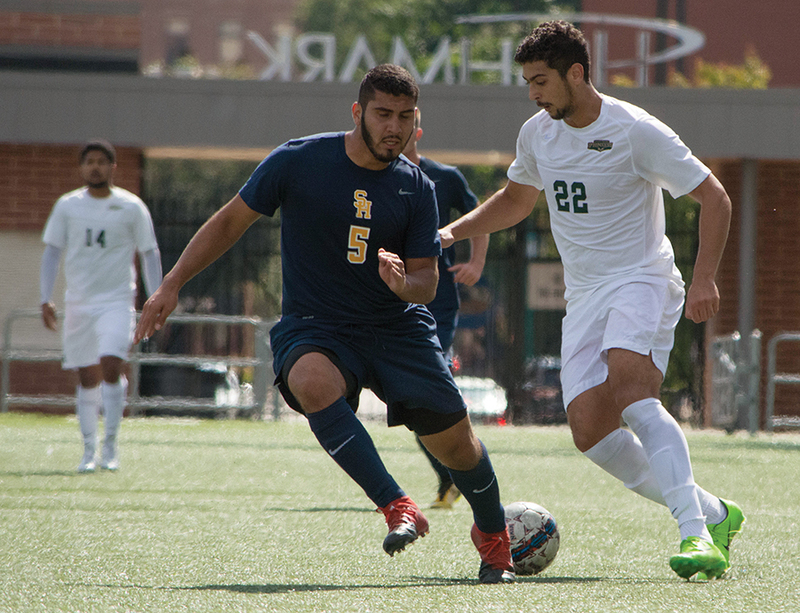 The Point Park men’s soccer team was able to bounce back for a 2-0 win over Siena Heights on Saturday after dropping its first two games of the season. Both teams were coming into Saturday morning’s match with 0-2 records. The Siena Heights Saints hail from the challenging Wolverine-Hoosier Athletic Conference of the National Association of Intercollegiate Athletics (NAIA). The Pioneers got on the board 13 minutes into the contest when sophomore forward Roberto Whitley netted what would become the game-winning goal. Point Park took a 1-0 lead into halftime and led in shots 11-6 at the midway point. In the 72nd minute, freshman forward Mitchell Roell scored an athletic bicycle kick goal for the game’s second-and-final score. The Pioneers collected four yellow cards and 14 fouls in the bout. Junior goalkeeper Ryan Daniels made his Pioneers debut, starting at goalkeeper and posting a five-save shutout. Daniels transferred to Point Park from San Diego Mesa College. Juan Somoza, a sophomore transfer who had started in net the previous two games and Daniels will be on rotation as the team’s goalkeeper throughout the season. The team played with more confidence and promise than in the previous two games, as the Pioneers sent off 19 shots against the Saints. Point Park only managed eight shots in each of its first two losses. The Pioneers look to keep up their strength of play in upcoming games. The Pioneers hit the road for the first time Wednesday, Sept. 13 to face off against Penn State-Beaver, then are back home Sept. 16 against Pikeville College.